Once again, our love-lorn Aggie is off for adventure, hoping to forget her once fiancé and currently stoic neighbor, James Lacy. At the prompting of a fortune teller, Agatha thwarts her own better judgement and decides to spend some time away in Norfolk. Her finger landing on the map, she picks the village of Fryfam at random to be her home away from Lacey. Greeted by an old-school, unfriendly lot of villagers, mysterious lights in the depths of the night, thieves, and snobby aristocrats (one certain Tolly), Agatha discovers that her chosen distraction isn’t so great. Deciding to take herself in hand and receive some inspiration from the miserable lot she has found herself associating with, she sits down to pen Murder at the Manor – an unfortunate choice when the muse for her killing tale ends up murdered the next day – the same way he was in Agatha’s one stab at fiction. Heralded in with the news of murder and Agatha as prime suspect, Sir Charles Fraith arrives in Fryfam for some sleuthing and our down and out heroine agrees to once again embroil herself in the world of murder – if only to forget her lacking love life for a little while. In the tenth Agatha Raisin cozy mystery readers are once again ready to join forces with our lovable, albeit greatly flawed, Agatha. Tough in words and deeds, Agatha uses her sharpish ways to hide an incredible sensitivity and perception of worthlessness. Agatha cannot stand to be alone with herself, and beneath the layer of quaint village life and an old-school mystery, the series is picking up a plaintive air, a realistic depiction of a lonely middle-aged woman, desperate and no longer self-assured. It’s hard, and sad, but frankly, this nearly teenage exuberance of emotions and ability to be hurt and yet recover quickly, returning to those who have proved treacherous, is who Aggie is and we love her and fear for her at the same time. Nothing has changed in The Fairies of Fryfam except, perhaps, that readers have stopped criticizing the weak elements of the series and started to realize that M.C. Beaton understands Agatha’s flaws as a character, particularly her actions and reactions to love, and is unraveling an important character story framed by these poor decisions. I’m scared for Agatha, especially at the conclusion of Fairies of Fryfam when resolution to the Lacey story is finally, rashly, achieved. But before I go there, let’s talk about the atmosphere. M.C. Beaton’s Agatha stories have readers returning for two main reasons: 1) Beaton truly understands how to draw a cozy atmosphere. While her style is rapid, her stories quickly paced and resolved, the creation of her world is an elegant thing, vivid and drawn out without taking up a lot of page space. I’m not really sure how she does it, and frankly, I don’t care. I’m too busy enjoying time with Hodge and Boswell by the fire, too comfortable listening to Agatha’s treks around blustery terrain during winter time to wonder how the spell is woven. Let’s just say, I was enchanted from the beginning of the series and I remain in a world where I can see and feel everything through Agatha. The second reason (you knew that I would get to it eventually), is the characterization. I’ve already touched on this a little, in that Agatha is flawed and doesn’t always (ok, almost never) makes the adult decision as regards her own personal life. Yet, something about her, perhaps something related to her very vulnerability, is charming. She’s feisty, realistic, sarcastic, prone to get involved in ludicrous situations, strong, and yet, easy to hurt. With her sharp tongue and tendency to get instantly irate, Agatha is both funny and memorable, and readers keep coming back to the series not really for the mysteries, but for the people who populate them, including our returning cast of favorites such as Bill Wong, Sir Charles, and, of course, Mrs. Bloxby. The mystery itself has lots of twists and turns, especially once the indomitable Sir Charles Fraith gets involved. As fans well know by this point in the series, the story isn’t about the mystery or its resolution, but more about Agatha and her interactions with the cast of characters that have come to populate her life. With that being said, the mystery does have a fair amount of page space and there is the requisite amount of sleuthing and murdering to keep readers engaged with Agatha’s life from multiple angles. It’s not the best mystery, or even Agatha’s most engaging, but it does the trick. The conclusion – well, this is where the story either sinks or swims, depending on what you want. The conclusion is rushed, delivered with no preparation and little, if any, after thought. However, there is finally a resolution in the Agatha/James story. I’m not saying that readers will be entirely satisfied . . . but what we have been complaining about has finally occurred. Be careful what you wish. The series ends on a darker note, perhaps because that’s just what we as readers intuit, leaving everyone ready to buy the next in the series and see how Agatha gets out of this one. 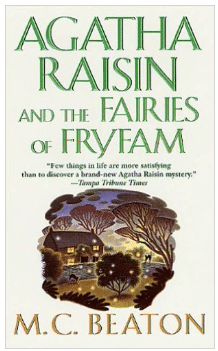 Intriguing, surprising, and cozy Aggie as always, The Fairies of Fryfam is another addicting adventure in the cozy English Cotswolds. Recommended.